The melting and freezing point change with pressure, but normally they are given at 1 atm. A pure substance has the same freezing and melting point (in practice a small difference between these quantities can be observed). In fact, in wax precipitation linear hydrocarbons from C1 to C15 as well as aromatics are absent, therefore there is no need for the melting point of very light hydrocarbons. For mixtures of hydrocarbons, the average molecular weight can be used in the equations, and then the melting temperature must be considered as the average melting temperature of the mixture. Listed, measured values of melting point of nonylcyclopentane is -29°C. A wax consists of 65wt% n-alkanes with an average molweight of 420 g/mol, 10wt% alkanecyclopentanes with an average molweight of 405 g/mol and 25wt% alkanecyclohexanes with an average molweight of 430 g/mol. What will the melting and freezing point of this wax be? Note: The average molecular weight of 430 g/mol corresponds to a carbon number of 29, and thus, it is outside the validity range of Eq.(3). However, it is not expected to give large errors. Since this is a mixture of compounds, and the average melting/freezing point is calculated from average molecular weights, the real melting and freezing will occur over a temperature range. The solid wax will start to melt somewhat below 51 °C during heating, and the liquid wax will start to freeze somewhat above 65 °C during cooling. How far from the given temperatures it melts or freezes will depend on the width of the molecular weight range of the wax. Engineering ToolBox, (2017). Melting point from molecular weight. 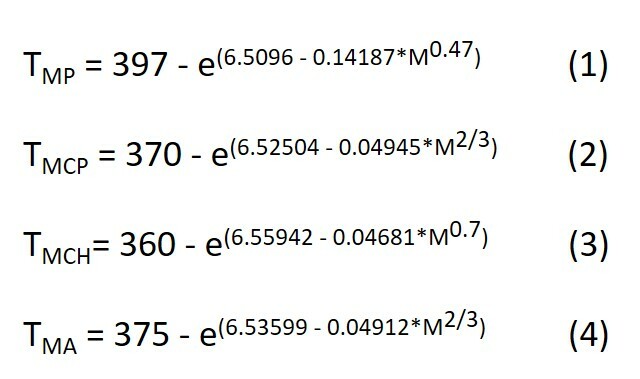 [online] Available at: https://www.engineeringtoolbox.com/melting-freezing-point-molar-mass-molecular-weight-hydrocarbon-aromatics-alkanes-cycloalkanes-paraffins-naphthenes-estimate-predict-calculate-d_1963.html [Accessed Day Mo. Year].